Can horses run on water? Of course! With a Honda outboard motor, you'll be galloping on the water in no time! Before you race into selecting an outboard motor, you should first understand what horsepower is. Horsepower (hp) is simply a measurement of power by the rate at which work is done. In this case, it's how much propulsion is created by the force of the engine spinning the propellers that are acting against the water to drive the boat forward. To get the most out of your boating experience it's important to select the right engine according to the size, weight, and drag coefficient (how easily it moves through water) of your boat. That way you will not be disappointed once you hit the water. Although you may want the biggest motor you can fit on your vessel, that could be a mistake! It can take a surprisingly small amount of power to really get things moving. Selecting the correct engine is a balance of power and portability. The next thing you should do is to consider the type of boat and activity for which it will be used. Ideal for small tenders, canoes, jon boats, and inflatables, the Honda Marine's 2.3 horsepower outboard motors are a porter's best friend. The ultra-lightweight outboards are easy to transport and ready for fun. These lightweight motors have everything you want: easy starting, fuel efficient, and quietness without sacrificing performance. Great for tenders, dinghies and daysailers, these 4 - 10 horsepower motors offer more of what you need: more charging power, easier to use features, and quieter, more dependable performance. The traveler can also use these as a "kicker motor" for sail boats if the wind dies down. With the optional Power Thrust design, you’ll get an even more powerful motor, with 60% more thrust in reverse and 15% more in forward. These outboards are the most versatile on the market! 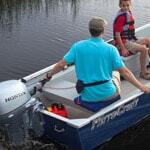 For motorboats and sailboats, the 15 - 20hp outboard motors are portable powerhouses made for cruising. Weighing in at a mere 104 pounds, they are some of the lightest, yet most powerful motors in their class. They also are able to charge anything you throw at them, so you can crank-up the tunes and charge your electronics without worry. Cruisers will be amazed how powerful, quiet, fuel efficient, and packed with features these engines are. 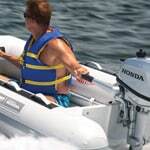 Honda is simply the best-in-class when it comes to engines and outboard motors. Honda is renowned for its engineering reputation for building the most dependable and reliable engines. Boaters of all types look to Honda's Marine line to deliver powerful, dependable, and easy to use outboard motors that are the quietest on the market. So, whether you're portaging a canoe or sailing the high seas, we are confident that you will find the outboard motor that matches your unique boating style while exceeding your expectations. Small Outboards for Every Boater.. Our Power Equipment Direct how-to library can help you learn about Official Photo Contest Rules, What to Do When Your Engine Fails and Proposition 65 Product Labeling.